It may be winter, but work is continuing on the renovation of Danville’s historic Fischer Theatre. The generosity of Danville philanthropist Julius W. Hegeler II allowed crews to wrap up repairs and restoration to the outside of the building before winter arrived. A new two-story addition, with new restrooms and an elevator, was added to the south side of the building. The results of the work can be felt inside the lobby and auditorium which is now draft free and much warmer. Workers from Offutt Development, the General Contractor, tuck pointed the exterior of the building. New windows have replaced the old drafty windows on the upper story and the roof has been replaced. 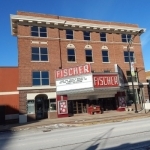 Adding the addition on the south side of the Fischer has allowed for the reopening of the original doors that previously were between the Fischer and Palace Theatre next door. During some needed demolition in work inside the Fischer auditorium workers discovered original walls, staircases, arched windows and the outline of fireplaces that once heated the Grand Opera House. It was the name of the building when it was originally built in 1884. Extensive work has been done to restore the integrity of the ornate features. And recently volunteer crews have been working to remove some original doors and trim on the second floor so they can be restored and used in the renovation. Volunteers are still needed to help with those efforts. ‘’The Vermilion Heritage Foundation Board is overwhelmed and grateful for the generosity of Julius Hegeler and the talented work of Offutt Development,’’ said board member Phillip Langley. You can follow the progress of the renovations on the Fischer Theatre Face Book page.